The researchers explored the impact of language used in both written and oral communication by legal services providers and the Legal Ombudsman. They consulted with staff at the Legal Ombudsman and also carried out 15 face-to-face interviews and four focus groups with members of the public, both those whose complaint to the Ombudsman had concluded and those who had used a legal services provider but not complained. Responses suggested that, generally, communications were clear and straightforward and that the Legal Ombudsman’s language is an improvement on that used by legal services providers. There were a number of areas, however, in both written and oral communications where improvements could be made. Other comments include that the term ‘impartiality’ implies ‘sitting on the fence’ and being toothless to enforce recommendations, and that ‘premature’ (used in relation to a complaint that has not yet gone through the internal complaints procedure of the provider) is associated ‘with small babies or with a sexual context’. More insights on the language used around informal resolution suggest the need for more clarity about the process used in this informal stage, something we highlighted in our report on informal resolution approaches used by ombuds. ‘…several of the calls were felt to be overwhelming and hard to understand. This was due, in large part, to their lack of structure which felt baffling to the customer: for example, the informal resolution with remedy call started with the staff delivering a decision, when later it became apparent that this was actually a first offer (“It began as a decision, then it became a bartering thing.”)’. In terms of redress, ombuds often use the term ‘remedy’, but this was seen by some interviewees as ‘medicinal’, as if a dose of remedy would fix the problem. These interviewees argued that, where a financial remedy is being recommended, ‘compensation’, ‘cash settlement’ or simply ‘settlement’ would be more appropriate. Job titles within ombud organisations were also potentially challenging in that, although they appeared to confer a welcome right to escalate a complaint (from, for example, investigator to senior investigator to Ombudsman), it also felt to some like scaling a great height, and in doing so it implied that the investigator’s opinion is less valuable. The findings give valuable insights into the perspectives of users of redress mechanisms, including but not limited to ombuds. They also give pause for thought for anyone involved in the design of grievance and complaint procedures. This is a case study of a recent attempt to introduce a gender-neutral title for ombuds in new legislation. The attempt failed when the legislature deemed arguments about brand recognition were more persuasive than arguments about equality. The Committee preferred that the new office should be known as the Northern Ireland Public Services Ombudsman (NIPSO) as opposed to Public Services Ombudsman for Northern Ireland (PSONI). The terminology was not an explicit part of the consultation. Nevertheless, in its consultation response the Executive Committee of the Ombudsman Association highlighted its objection to the term, arguing that use of the term ‘ombudsman’ is important to protect the brand recognition of these services and schemes and that its members ‘have cultivated the public’s awareness of these values to encourage the use of their services.’. The Ad Hoc Committee also received submissions from the International Ombudsman Institute, the International Ombudsman Association, and the Welsh and Irish Ombudsmen that the term ‘ombudsman’ is of Scandinavian origin, its original meaning in Swedish is ‘representative’, and it is therefore already gender-neutral. The committee commissioned a briefing, from the Research and Information Service, on the etymology of the term. This document, entitled ‘Ombudsman Gender Neutral?’ (Northern Ireland Assembly, Paper 81/15, 9 June 2015), cited arguments on either side of the divide (as to whether or not ‘ombudsman’ is gender neutral). These included the UN Multilingual Terminology Database, which states that ‘ombudsman’ is rendered gender neutral by use of ‘ombudsperson’, ‘ombuds’ or ‘ombud’ (or even ‘ombudswoman’ if preferred by a female office holder). The briefing noted that the Swedish Parliamentary Ombudsman had in the past responded to a question on this issue: ‘Government’s linguistic experts had stated that ombudsman and other similar words with the suffix –man. i.a. [sic] talman, talesman, fortroendeman, are gender neutral in the Swedish Language’. ‘Talesman’ is ‘spokesman’, clearly not a gender-neutral word. The required censure ought to have been obvious to anyone with no need of knowledge of Scandinavian languages: the contributor provided a neat breakdown of the term, apart from the final statement that ‘mand’ means ‘person’. It means that in the same way that ‘man means ‘person’, i.e. woman is subsumed within the generic ‘man’. To say that the term Ombudsman is gender neutral because ‘man’ equals ‘person’, a statement we strongly disagree with in any event, is different from the OA’s and others’ argument that that this is an indivisible string of letters with a particular meaning and therefore can’t be tinkered with. Furthermore, the Northern Ireland Assembly’s adoption of the term ‘chairperson’, and Members’ consistent use of the pronoun ‘he’ with ‘ombudsman’ (as demonstrated in Assembly meeting minutes), render its support for this argument ludicrous. ‘The word is of Scandinavian origin, and its original meaning in Swedish is “representative”. We received a research paper on the etymology of the term. We were advised that “ombudsman” was a trusted and recognised brand and that to change the title could cause confusion among the public. … research was commissioned into the etymology of the term “ombudsman”, and it became clear that the history of the word suggests that it is not gender-specific, which may be counter-intuitive, …. In the end, the Committee for OFMDFM was satisfied that the term “ombudsman” is not gender-specific’. Nevertheless, the argument for brand recognition proved more persuasive than the argument for equalities and anti-discrimination and the evidence of alternative terms in use, and the Assembly proceeded to make the hundreds of amendments to change ‘ombudsperson’ to ‘ombudsman’. The terrain of ombuds complaints-handling practice has also changed since we mapped it in our study, something we learned at the Irish ombudsman staff conference on 19 February. We were invited to present our study of the use of informal resolution approaches by ombuds in the UK and Ireland, our Nuffield-funded mapping research published in autumn 2014 (the report is available here: The use of informal resolution approaches by ombudsmen in the UK and Ireland ). We were warmly welcomed by Kieran FitzGerald of the Garda Siochana Ombudsman Commission (GSOC) and Peer Tyndall, Ombudsman for Ireland. Before the conference, we were invited to meet with Nuala Ward of the Ombudsman for Children. After marveling at the enormous bean bags and cinema for visiting children, we discussed with Nuala the implications of greater use of informal resolution approaches in terms of achieving justice for children and young people in Ireland. We were also impressed with the scheme’s own initiative powers, especially given the obstacles many children and young people face in making complaints. Afterwards, we presented our research to the gathering of staff from the many and varied ombuds schemes and commissioners in Ireland, all of whom had generously responded to our study. Attendees were not shy about challenging our findings. It was fascinating to discover, for instance, that the Garda Siochana Ombudsman Commission (GSOC), which handles complaints about the police, no longer uses face-to-face mediation between complainants and officers. It had been one of the five schemes (three of which are Irish schemes) using such an approach, albeit for a small percentage of complaints, but it found difficulty in getting consent from the parties. One of the other schemes using face-to-face mediation is the Press Ombudsman – again, for a very small percentage of its complaints. That scheme raised interesting issues for us about terminology, because they use ‘conciliation’ to refer to their formal process, and ‘mediation’ as the informal process. The confusion about terminology is an issue that runs across the entire project and is something we’ve commented on specifically before. Why are schemes using different terminology for the same processes, and the same terminology for what appear to be very different processes? Bernie Grogan of the Press Ombudsman suggested that we might have been better off establishing what the process terminology (mediation, conciliation, adjudication) means before inviting responses to the questionnaire so that people would refer to the same terms. Another suggestion from Peter Tyndall, Ireland’s national ombudsman, was that we could have asked respondents to describe what they do, and then develop a typology from the responses, rather than starting with definitions. This is similar to an approach taken by researchers from Queen Margaret University in a 2014 study of dispute resolution models used by ombud schemes internationally. In that, the processes were grouped into categories of evaluative, facilitative and conciliatory approaches. This helpfully avoided getting caught up in differing definitions. We’ll take all those suggestions on board if and when we take this research further. One of the points that came across very clearly is that what’s needed is a more in-depth, up-close observation of what ombudsfolk actually do. What are the techniques and practices they use to resolve complaints early and informally? What do the parties feel about the experience? How do the outcomes compare to those decided following investigation? A lively discussion followed our presentation. Participants discussed the possibility of a one-stop shop, or common portal, for complainants to access and be directed to the appropriate ombud scheme. Others mentioned the need for opportunities for training and development that are tailored for the staff of the schemes in Ireland, with a particular focus on investigation techniques. A representative from the Financial Services Ombudsman explained a recent change in their informal resolution approach, with more focus on resolution at an early stage. And a representative from the Ombudsman for Children noted that ‘resolution’ means different things to different people – for that scheme, resolution that is in the interests of the child is paramount. That scheme is also unusual in that it is seeing an increase in complaints, while others are seeing a decrease. It was a great privilege to be in a room with so many knowledgeable and expert individuals. Although the terrain has shifted somewhat since our study, there is clearly an appetite to look more closely at the place of informal resolution in ombuds practice. In October 2014, we launched (together with Carolyn Hirst) a mapping study titled ‘The use of informal resolution approaches by ombudsmen in the UK and Ireland ’. We discussed at length whether to use the words ‘ombud/s’ or ‘ombudspersons’ rather than ‘ombudsman/men’, but decided on the latter to avoid the title itself becoming the centre of attention rather than the content of the report. However, we felt compelled to touch on this question at the launch, which was attended by a number of ombudspeople as well as academics. After presenting one aspect of our findings, concerning the multiplicity of terms used by schemes to describe the same processes and identical terms to describe different ones, we added a closing remark on the problematic matter of terminology in the use of the term ‘ombudsman’ itself. This included an assertion that the word ‘man’ in Swedish means exactly the same as it does in English, and that the argument that the term is gender-neutral therefore does not wash.
A much-respected former ombudsperson wrote to us with a series of thoughtful suggestions designed to circumvent the problem. While recognising that the term ombudsman has been ‘de-masculinised elsewhere as in the South African FAIS Ombud and US university Ombuds, it is not making much headway in Europe or the [rest of the] Commonwealth, and… we have to live with the word as it is, not least because it is ‘now included in various statutes’ (emphasis ours). When referring to entities or services, use ‘ombudsman schemes, offices, or services’. When referring to those who lead ombudsman offices, use ‘heads of ombudsman offices’ or ‘ombudsman post-holders’. When referring to individuals who perform ombudsman decision-making functions, in formal speech or writing, use ‘ombudsman decision makers’. When referring to a mixed group of those heading or working in ombudsman schemes, in more informal or light-hearted speech or writing, use terms such as ‘ombuds-folk’, ‘ombuds-people’ ‘ombuds-workers’ or ‘the ombudsman community’. We welcome any such engagement, especially where it recognises the problematic nature of the terminology, but we are perplexed as to why the ombuds community is so intent on engaging in both linguistic and conceptual acrobatics by insisting that ‘man’ does not mean ‘man’. At the risk of generating groans of ‘oh not this again’, we feel compelled to take issue with the disappointing stance taken by the Ombudsman Association (OA) Executive Committee in their response to the recent consultation on the proposed Northern Ireland Public Services Ombudsperson (NIPSO) Bill, which, as the title suggests, refers to the office holder throughout as ‘ombudsperson’. We suggest that it would be one thing for the OA not to take a view one way or the other. But to include such a robust objection to the terminology in the proposed legislation appears to be a political stance, aimed at stifling discussion. Instead, the OA could have congratulated the Committee and the Northern Ireland Assembly on its forward thinking in using a truly gender-neutral term that is not yet widely accepted, and if necessary, promote a discussion on other suitable alternatives. We queried this aspect of the response and expressed concern that the underlying principle of fairness (required for OA membership and cited in the response) does not appear to include equality and anti-discrimination. It may be that the Executive Committee members do not believe the terminology raises equalities issues. They are instead focusing on the need to avoid confusion and protect the ‘brand recognition’ of the term ‘ombudsman’. Our question is therefore: is the ‘man’ of ‘ombuds-man’ essential to the brand? If you enter ‘ombudsman’ or ‘ombudsperson’ into Google Translate and translate from English to Swedish, you get ‘ombuds’. Conversely, Google Translate converts ‘ombud’ in Norwegian to ‘ombudsman’ in English. This suggests that in Scandinavia, it is the ‘ombud’ part of the term that distinguishes an ‘ombudsman/woman/person’ from other offices such as adjudicator or commissioner. With that in mind, we wrote to the Norwegian Equality and Anti-discrimination Ombud (Likestillings- og diskrimineringsombudet; the ending ‘et’ in Norwegian stands for ‘the’), to ask about the ‘mann’ (‘man’ in Norwegian) part of the word which they had discarded from their title. In response we were told that theirs was the first scheme to adopt the term ‘ombud’ in place of ‘ombudsmann’ when established in 2006. They sent us the White Paper for the law establishing the Gender Equality Ombud. The document uses the term ‘ombudet’ (the ombud) rather than ‘ombudsmann’ throughout the document, apparently without any need to engage in a terminology discussion or to justify the choice of title, despite being the first scheme to be so named formally. This made a refreshing departure from what happened in 1979 when a committee was established to consider statutory amendments to the office of the Norwegian Parliamentary Ombudsman. The Select Committee considered the appropriateness of the title ‘Ombudsmann’ and discussed its pros and cons. It noted that the title does not say anything about actual function of the position holder, and importantly, that the term was not gender neutral. On the other hand, it was noted, the title was well incorporated in both Nordic and international usage. The Parliamentary Ombudsman himself argued at the time that the Ombudsman office was an entirely personal arrangement, in that the Ombudsman must take a personal decision on all cases and cannot delegate decisions to others; the term ‘Ombud’, on the other hand, is more about the office than the person. In other contexts where the expression ‘Ombud’ is used, it is talking about institutions or positions where it is not essential to distinguish between office and person. In the end, despite recognising that the term was not gender-neutral, the Select Committee considering amendments to the Office of the Norwegian Parliamentary Ombudsman rejected the minority view that the time has come to replace ‘sivilombudsmann’ with ‘sivilombud’, and concluded that the traditional term was to be retained on the basis that it was so well established that there is no basis for change. The document uses the term ‘ombud’ throughout to denote the office, as in: ‘Ombudene kan ha mange ulike funksjoner’ i.e. ‘the ombuds can have many dissimilar functions’. Hence, the office of ‘Children Ombudsman’ is called in Norwegian ‘Barneombud’,i.e Children Ombud, and the institution is referred to as ‘barneombudsinstitusjonen’ – the children ombud institution. We accept there is clearly no consensus even in Scandinavia with regard to replacing ‘ombudsman’ with ‘ombud’. So while the Children Ombud (Barneombud) became the model for the equivalent Swedish office established in 1993, the term ‘ombud was not adopted’, and it was instead named ‘Barnombudsmann’ – Children Ombudsman. However, as the above discussions and examples demonstrate, it is not viable to state that ‘ombudsman’ is gender neutral on the basis of its Scandinavian origin, meaning and current use. Douglas Hofstadter, a professor of cognitive science in the US, wrote a stinging satire on the opposition to adopting gender-neutral language. In “A Person Paper on Purity in Language (1985)”, he used what he admitted was a shocking analogy to expose the absurdity of presenting ‘man’ suffixed words as gender-neutral. In the essay, Hofstadter replaces ‘man’ with ‘white’. Have a read and see what effect it has on your assumptions. We don’t believe there’s a right or wrong answer to this. But we’d like to encourage people to discuss it rather dismiss it. There are plenty of respectable ombuds organisations around the world that recognise the equalities issues of the term and use alternatives that have, over time, become well established. That alone suggests it’s worthy of discussion. ‘Ombud’ is often used in the context of higher education, not just in North America, where it is the prevailing term, but in Europe as well. For example, the Studentombudet for Oslo and Akershus University College of Applied Sciences (HIOA) mentions her ‘ombuds’ work on Twitter, although she refers to herself as an ‘ombudsperson’ on her blog. But is it not the ‘ombuds’ part of the term that is meant to be protected? 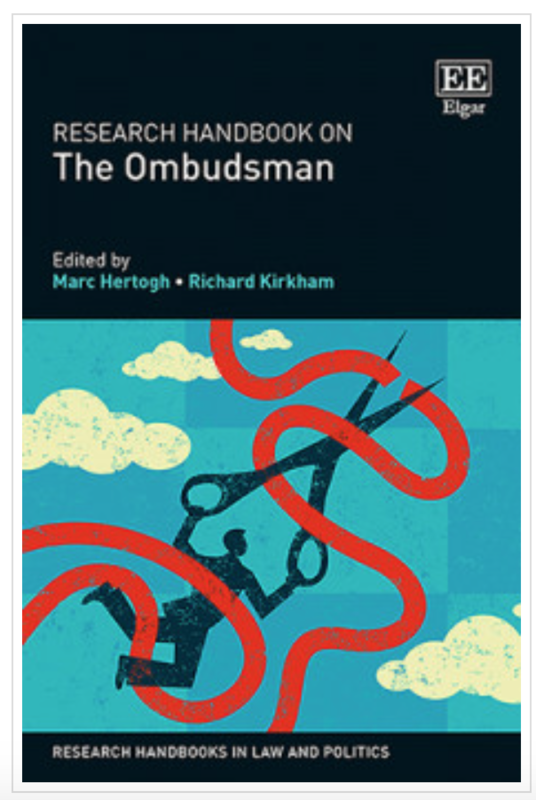 If the intention is that only ‘ombudsman’ should be legally protected (although we note that the Regulations say that ‘that the specified words and expressions are specified in all their plural, possessive and (where relevant) feminine forms’), then even if there were legal protection of the title here in the UK, there’d be no barrier to someone setting up as The Telecoms Ombudsperson, or The Ombud for Health Services, or National Consumer Ombuds Service. It seems disingenuous to take such a literal stance, and contrary to the intention of efforts to protect the meaning of the ombuds role. Surely it’s time we had this conversation in the UK? Tell us what you think.